The baby was found face down having survived nine hours in cold and wet conditions. Francis Crowley, who was being held on $50,000 bail on a charge of criminal endangerment. A FIVE MONTH old infant who miraculously survived more than nine hours being buried under a pile of sticks and debris in the woods of western Montana suffered only minor injuries despite wearing wet and soiled clothes in cold weather, authorities said. 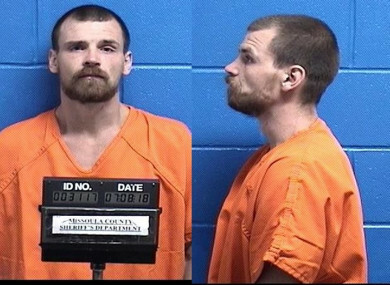 Missoula County Sheriff’s deputies were called about 8pm Saturday about a man threatening people in the Lolo Hot Springs area of the Lolo National Forest. Deputies apprehended the man, who indicated that a baby was buried somewhere in the woods. The sheriff’s office hastily put together a search crew of federal, state and local officials that combed the forest outside the hot springs for six hours before a deputy heard a baby’s cry at about 2.30am on Sunday. He found the baby face-down under the pile of sticks and debris, dressed only in a wet and soiled onesie in the 8 degree Celsius weather. “He suffered some minor scrapes and bruising but overall is in good health,” sheriff’s spokeswoman Brenda Bassett said in a statement. The baby was taken to a hospital. Custody of the child has been referred to the state Division of Child and Family Services. Spokesman Chuck Council declined to answer any questions about where the child will be placed or how the baby will be cared for, citing medical privacy. Francis Crowley, 32, was being held on $50,000 bail on a charge of criminal endangerment. Additional charges will follow, the sheriff’s office said. Crowley is from Portland, Oregon, and was previously arrested in June in Missoula on a fugitive warrant from Oregon. Crowley was released when Oregon officials decided not to extradite him, Deputy Missoula County Attorney Jason Marks said. Email “Arrest made as baby found alive buried under debris in Montana woods”. Feedback on “Arrest made as baby found alive buried under debris in Montana woods”.